This summer my family and I traveled to Okoboji, Iowa where I did the children’s teaching for the Okoboji Bible Conference. It’s a super conference that families travel to from all over the country to enjoy not only the conference, but the family activities in the area from the lake to the amusement park and more. I taught mornings and evenings and then our family had fun during the day too. One evening a sweet little girl came up to me, gave me a hug and slipped me a note “to read later.” One side was a picture of her holding my hand and the other was said, “Carl, you are the dest mijishan I had ever met. 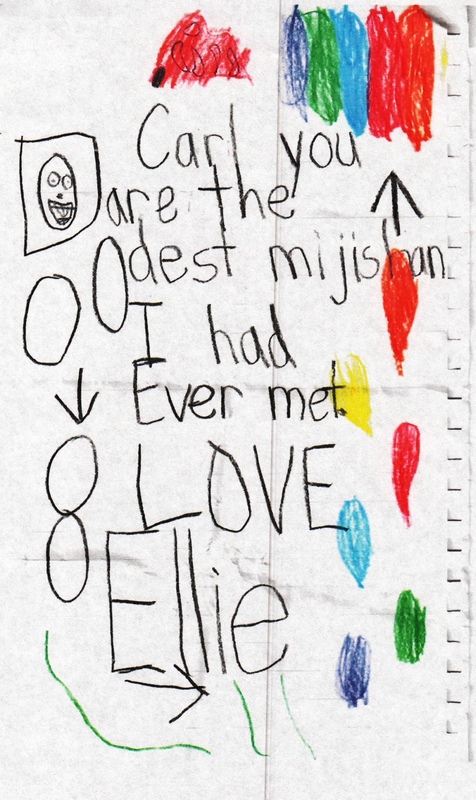 LOVE Ellie.” She even drew two linking rings unlinked, followed by an arrow and then they are magically linked! Of course, this simply note made my day, and her creative spelling only added to the charm. Out of a gymnasium full of children one little girl took some time to get some paper and crayons and make me a little note… a note I shall be saving. It reminded me of an encouragement note I got the last time I spoke at the Okiboji Conference in 1996 that I still have and blogged about long ago from the mom of Phil Vischer. Simple acts of appreciation mean a lot to people. We often assume people get lots of affirmation – but usually this is a false assumption. When was the last time you got out a piece of paper and wrote someone a note of encouragement? A word of thanks? Have you let someone know lately you think they are the best? In an age of tweets, ‘likes’ and text messages a snail mail letter or hand written note means even more than it ever did. Times Flies When You Are Growing Up!